Ty finnaly on SBTV!!! As part of their Skooled series Rodney P pulls in legends of the UK hip hop game in front of the camera to show the youngers how the elders do. As always Ty is on point with some poignant lyrics that hopefully the viewers will pick up and younger MCs can take some notes and learn from. Lyrics with meaning. Great to see Ty on this platform for me by far still the MC in the UK game. If you haven’t already checkout his new EPs here. Big up SBTV on the series great concept. A simply stunning performance from the brilliant Hayley Cassidy. Filmed at last months We Play Live Music Hayley breaks down one of the standout tracks from her Stripped EP acoustic style. She shows off her full vocal range in all its glory. This is a masterclass in vocal brilliance. Makesure you watch all 6 minutes!!! This lady’s time will come real soon!!! What better way to start your week then some fresh quality R&B from UK??? 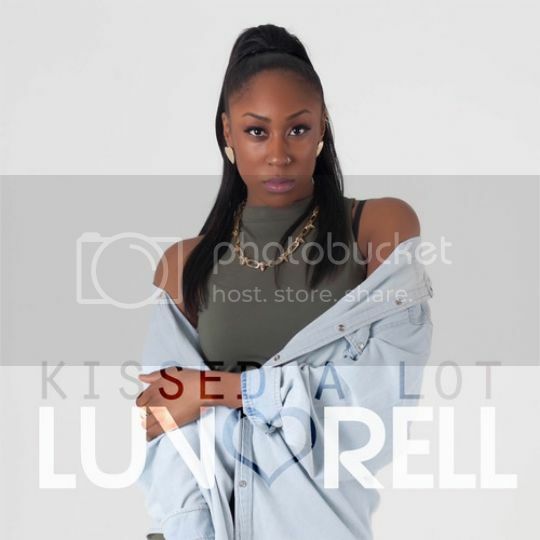 Luv’Rell is a young singer songwriter from North London with a simply sublime vocal. 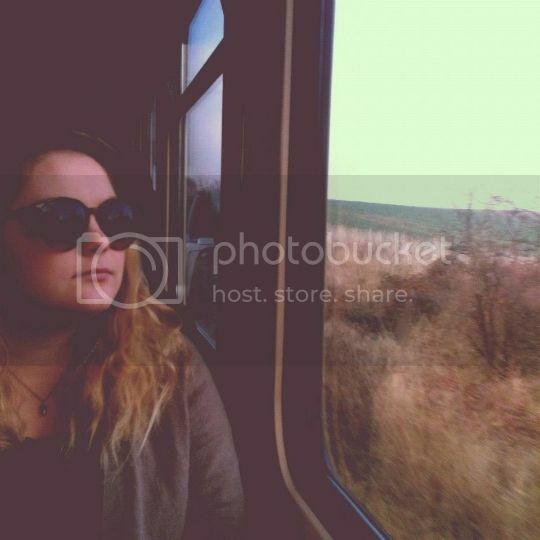 Throughout the track she throws in some real nice runs and her harmonies are to quote the missus “lush”. Production from the extremely talented Emmavie helps to bring out the best in Luv’Rells voice and there are some great ideas in the production throughout the track (especially the ending). This is a slice of late 90s early noughties R&B that is absolutely ridiculous, the kinda tune that as they used to say would make a garage DJ wanna be a HipHop and R&B DJ! I want more!!! Download for free now. Yesterday Cleo Sol dropped the second of her series of free to download mashup singles. Here she takes 2 massive british anthems of the 90s from completely different genres and gives them a work over turning them into her own. Taking Massive Attack’s classic Teardrop and merging it with the Verves “Bittersweet symphony” is no mean feat and yet she pulls it off. Really like the angle Cleo and her team are taking with these downloads. She is making a clear statement that she is not just a pop R&B artist and has a lot to offer as well as her superb vocal ability. Listen enjoy and download! A bit of spoken word on Friday morning to end your week never hurt anyone. Nichol Keene is one of the rising stars of the poetry world. One third of the brilliant “Elephant Collective” (Zia Ahmed and Toby De Angeli sick crew very well recommended) she is currently spreading her words and stories around the festivals and further afield. This is her ode to the city that she calls home. Lots of lines many of us from a city can relate to. Listen, enjoy and keep an eye on this young lady definitely one you should be watching. Our friends at All About Good Music recently co-hosted the Manchester leg of the Soul Acoustic tour. A fantastic project that took some of the country’s finest up and coming vocalists and provided them with the means to perform in front of crowds OUTSIDE of London (something severely needed if the scenes are ever likely to move forward). The guys at AAGM as they do with all of their superb events have begun putting out visuals of some of the performances from the night. My favourite so far is from the immense vocal brilliance that is ShezAr. Check the video here as she goes IN. Love the way the crowd are getting into it too (London crowds take note sometimes you gotta give to receive). 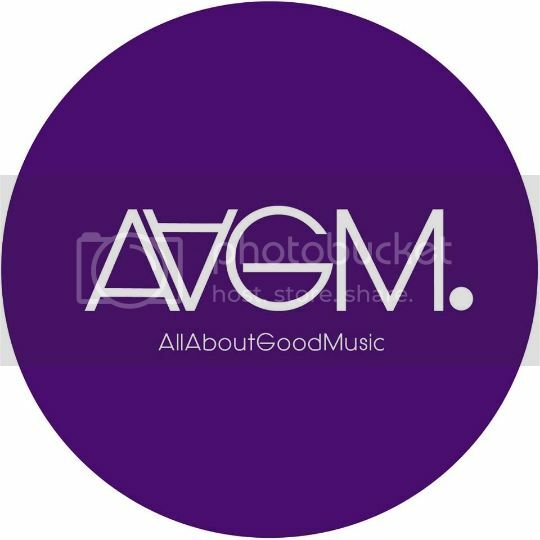 To see more videos from the likes of Kaleem Taylor, Terri Walker, Kof and more checkout the AAGM youtube channel here. 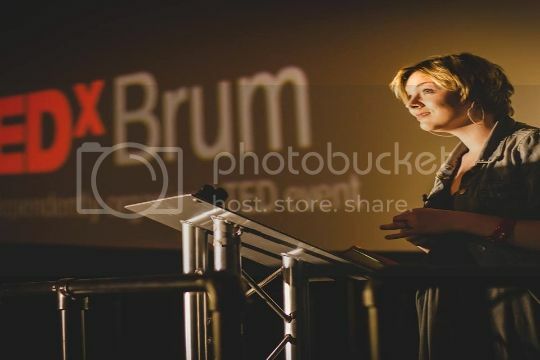 One of the most powerful poets I’ve had the pleasure of booking for a Music is Remedy Event Jodi Ann Bickley was recently invited to give a Ted Talk in her home town Birmingham. She was invited to talk about her fantastic 1 million letter project that has brought joy to many people all around the well. It is given her own personal trials massively inspiring and a story that you must hear about and spread as I’m sire there is at least one person in your world who can benefit from what this remarkable young lady has done. Watch, Listen, Share and be Inspired! 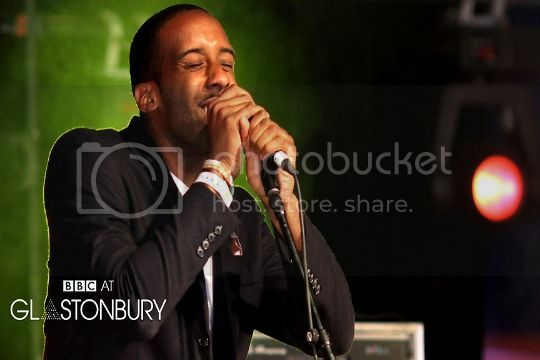 Last month while i was busy tying the knot Shakka was at Glastonbury not only rocking the stage with Wretch for renditions of Blackout but he also performed a solo set on the BBC Introducing stage. It wasn’t quite the full band set up but nonetheless as is always the case with Shakka the energy and quality are immense!!! The beeb have captured footage of “Sooner or Later” and the epic “Strength of an OX” from his ridiculous Tribe EP. Can’t describe how great it is seeing him on these platforms at present, hearing people singing along to his hooks. Am positive even greater stages await him. Checkout the two videos here. The Less Is More team have had a countdown running for a couple of weeks now. The clock finally ran down and at midnight they dropped the new video for Hip Hop Super Trio Midas Touch. 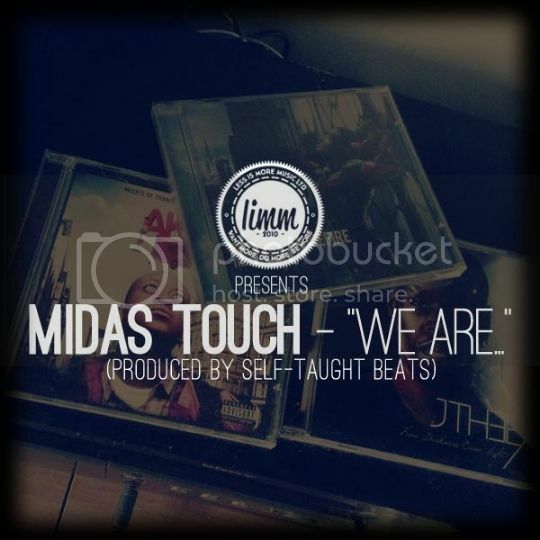 Midas Touch are J The Exodus, Phoenix Da The Fire and AKS all lyrical heavyweights in their own right and together they certainly bring the fire. The fact that the production on the track from Self Taught Beats is so classy (a horn section will do that!!! i’m just saying!!!) makes their job a lot easier and allows them to flow well effortlessly. If this is anything to go by i cannot wait to get my hands on an album! If you are feeling this you can get a free download by subscribing here. Job well done guys. 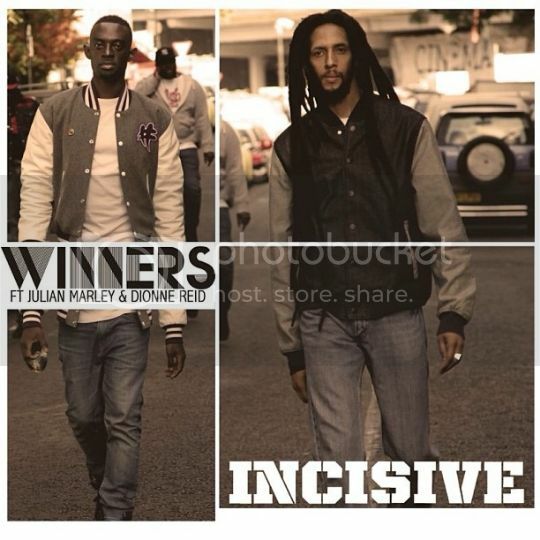 Incisive is back with a big tune perfect for the current summer heatwave we are enjoying at the moment. 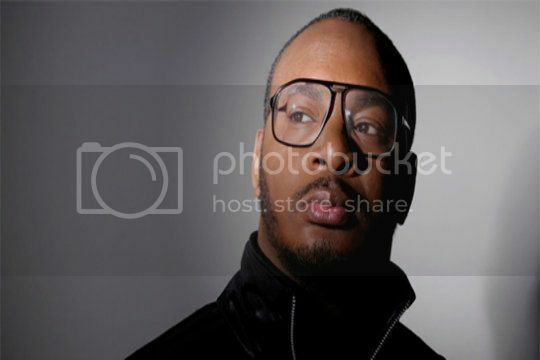 Winners is the new single following on from his much acclaimed “Where is he” Mixtape that dropped at the top of the year. In his own words he has pulled out all the stops to make this tune as good as it can be. From the guest vocalists on the hook one of the UK’s finest Dionne Reid is a fine choice to compliment Julian Marley’s (how the hell did he get a MARLEY on his track?????) raw vocal line. Both definitely confirm and authenticate the Reggae vibe running through the track. On production duties as usual is the ever consistent TE1 and also Obenewa was brought in to work on the hook, a dream team if there ever was one. This is a fantastic effort and the love the progression that is being added to Incisive’s consistency. Support this brother he’s on the rise.